A new site featuring video evidence will illuminate the ineptness, negligence and maliciousness of the Racine Police Department. The video evidence of the Polk vs. Hanson altercation was not sought out by Racine Police before they took action against Mr. Hanson. The video evidence will illuminate an armed aggressor entering Mr. Hanson's property, and an armed altercation over dog poop ensuing. The gun toting aggressor on Mr. Hanson's property is Brian Polk . Mr. Hanson defended himself with a machete. Due to the ineptness, negligence or conspiracy of the Racine Police Department against Mr. Hanson and his dog, the Racine Police Department shot Mr. Hanson's dog in the middle of his yard. The new site will be completed in the next few days. Thank you fellow Racine citizens who stood up, provided evidence and statements. Without the watchful eye of the public, the truth cannot be exposed. Patience - the capacity to accept or tolerate delay,trouble or suffering without getting angry or upset. Had the Racine Police Department took the time to conduct a proper investigation, a different outcome and a different person would have been arrested. Integrity- the quality of being honest and having strong moral principles. Art Howell and his staff misled and lied to the public about an internal review and investigation of the incident taking place. Had a review and investigation really been conducted by his department of the incident, the video evidence would have been found by the internal police investigation. Instead, video evidence of the altercation was collected and submitted directly to the D.A. 's office by private citizens 12 days later. Art Howell is a coward to face the reality of his departments ineptness, negligence and cowardness. An armed SWAT police cowardly killed a 30 pound dog that posed no threats. GRAND JUNCTION, Colo. — A man was arrested after allegedly pointing a banana at two deputies and telling them that he thought it would be a "funny joke" to post on YouTube to "lighten the holiday spirit." Police say the man, identified as Nathen Channing, 28, was not recording the Saturday incident. According to the arrest affidavit, Deputy Joshua Bunch first encountered Channing at approximately 11:15 a.m. Bunch, who was in a marked patrol car, saw Channing walking on the sidewalk. "I observed Nathen reach into the left side of his coat with his right hand and pull out a yellow object, pointing it in the air then in my direction as I approached him," Bunch wrote in the affidavit. "Nathen drew the object in the same manner someone would draw a standard handgun from a concealed holster." Bunch says he immediately ducked into his patrol car and drove away, afraid that Channing had a weapon. He then called another deputy in the area and warned him of the situation. The affidavit says Bunch saw Channing point an object at the other deputy, who initially thought it was a gun. "Deputy (Donald) Love stated he was in fear for his life at this point, and was in the process of pulling out his handgun when Nathen yelled 'It's a banana!'" Bunch wrote in the affidavit. When asked why he decided to point a banana at two deputies, Bunch says Channing told him that he "does a lot of YouTube" and he thought it would be a "funny joke." Bunch said Channing then informed him that he's a standup comedian and "it was just a joke that he realizes, now… is not funny." According to the affidavit, when pressed as to whether or not he was recording the incident, Channing admitted he was not. "I informed Nathen his reasoning did not make (sense) to me since he did not have anything to post on the internet," Bunch wrote in the affidavit. "Nathen stated he was just completing 'trial runs' of the joke." Bunch says Channing told him he thought the joke would "lighten the holiday spirit." A third officer was then called to the scene, and Channing was taken into custody at around 11:30 a.m., according to the affidavit. Channing is facing charges of felony menacing. RCC has looked into this further. Mr. Channing is from Fruitville Co. If you are from Fruitville, a Felony menacing charge of misuse of a banana is a serious offence. We recommend he appeal ! Help us stop Racine Police violence against animals ! Or whatever foolish line you may come up with this old proverb, the sheeple of Racine has bought into another confidence trick by the Racine Police Department. The comparison of the old saying Pig in a Poke to the 11-01-2014 police killing of Kurt Hanson’s dog fits perfectly. It appears the public are moving about as sheeple just as Racine Police Chiefless Art Howell and his occupying army planned, with the exception of the Racine County District Attorney’s office. The sheeple plan was going smoothly until a two hour surveillance video of the gun vs. machete event on Hanson’s property was delivered to the D.A.’s office. With video evidence in hand, the D.A.’s office forced The Racine Police Department into an investigation. RCC is does not have specific details of the conversations between the two offices but we are diligently seeking those records. Sheeple go about their business believing government is here to serve you, without questioning even glaring acts of negligence and aggression of the occupying army. PIG in a POKE is what the Racine sheeple have bought into at RPD. When shots of aggression are fired at sheeple by RPD, the sheeple look at themselves with a blank stare and say it wasn’t me, then go about their lives grazing as one after another sheeple victim goes down. Racine sheeple have few shepherds to protect them when the police wolves strike. Racine Police Chief Art Howell remains found at burial site in the Future! When you go into the Racine Police Department or Racine District Attorney’s office and ask about the 11-01-2014 police dog killing incident, all you get is silence. This silence shouts volumes about what is now going behind the scenes. And behind the scenes in RDP, the blue line is leaking like a sieve. Many Racine police are angry and/or embarrassed about the incident, which means some are talking. Inside sources have informed us that incident video in the hands of the Racine Police Department are now being minutely scrutinized. Statements made by Brian Polk and his residents are also being intensely scrutinized against the video evidence that has been secured by RPD. There are now constructive conversations going on between the RPD and the D.A.’s office as how to charge Brian Polk. One may ask why it is taking so long to charge Mr. Polk after they have viewed the video. The answer is quite simple; RPD staff now wishes to place Mr. Polk in prison for the longest possible duration, which means they plan on charging him with more than just obstruction. Why? “Payback , He(Brian Polk)made us look like asses” one source told us as he drove away in his squad. RCC looked at Wisconsin statutes regarding obstruction or lying to the police. The maximum penalty is 10,000 dollars and /or 9 months in jail. Click to view statute; statute 956.65. Additional weapon charges are being reviewed and are expected to be filed against Mr. Polk next week. Without the watchful eye of the public, and citizen courage to expose the Racine Police Department, Justice 4 Angel would have never had a chance in Racine. In Mythology, its men against kings, kings against gods and gods against the world. 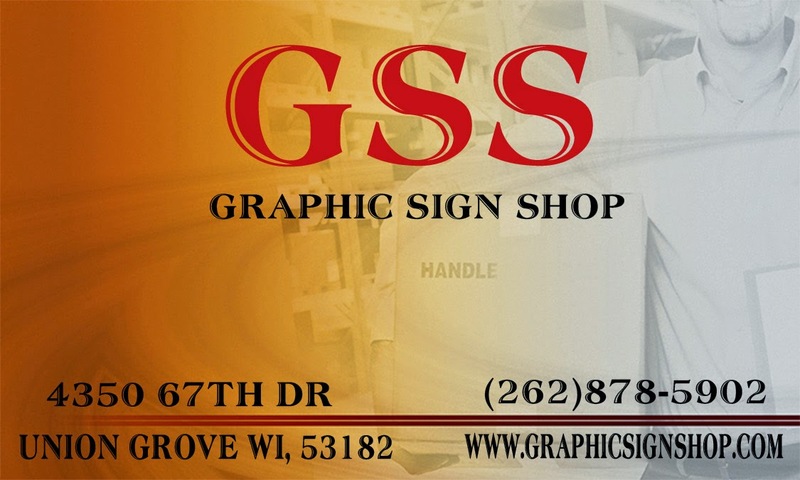 Does that sound like Racine? 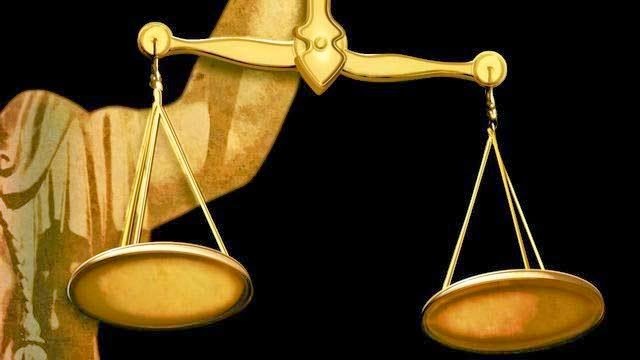 For nearly 2 weeks, the Racine titans of law had been clashing over the police pet killing incident of 11-01-2014 involving Kurt Hanson and his pet Angel. The Racine District Attorney’s Office had been sifting thru large amounts of information received from Racine citizens that conflicted with Racine Police findings and incident reports. The clashing came to a head when a 2 hour surveillance video of the inncident was provided to the D.A.’s office by a Racine citizen. The neighbor, traumatized by the event had been living in fear that the police would confiscate and destroy the video evidence of the incident. During the twelve days before turning in the video, the neighbor/witness was never contacted by the Racine Police Department. Which brings us to one of the Titans, Racine Police Chief Art Howell. Shortly after the police pet killing incident, CBS news 58 ran the following story. Racine -The Chief of Police in Racine addressed the dog that was shot and killed during a stand off on Saturday. CBS 58 obtained e-mails from the Chief to concerned citizens, upset over what happened that day. The Chief said that he is saddened over the loss of a domestic pet that, more than likely, had no malice against anyone. He added that during this standoff, the dog's owner threatened to use a body armor piercing crossbow to kill officers, and this subject threatened to use his dog as a weapon against officers as well. Chief Howell goes on to explain that after several hours of dialogue with crisis negotiators, the barricaded subject ultimately made good on his threat to introduce the dog into the active standoff and that after the dog was released, the dynamics of this encounter changed. According to court documents, the owner of the dog and the man involved in the standoff is Kurt Hanson. Hanson has a criminal history dating back to 1980. He has a number of convictions involving disorderly conduct and resisting police. His criminal complaint also details how police say he threatened them with weapons and the dog. The Chief said that after hours of trying to negotiate through dialogue, his officers were forced to deal with the distraction and unpredictability of having the Hanson's dog moving through the scene of this active encounter at a critical time. In that same e-mail, the Chief explained that in the event their review process exposes misconduct, or if they find that additional training could have resulted in a better outcome, they will take appropriate action as dictated by our findings. In a separate e-mail the Chief was more specific and said the department will also review the existing SWAT protocol to determine how to best deal with future situations of this nature. Racine police also planned on releasing 911 calls from the day of the stand off. On Sunday, a small group met outside the police station to voice their anger over the dog being killed. Here are the problems with Chief Art Howell’s following statements. “In that same e-mail, the Chief explained that in the event their review process exposes misconduct, or if they find that additional training could have resulted in a better outcome, they will take appropriate action as dictated by our findings. There was not an active review process or internal investigation into police errors, acts or omissions until the D.A.’s office received a 2 hour evidence video of the incident. 13 days after the Racine Police Department traumatized its citizens. Art Howell and his staff finally realized they could no longer hide the truth. Racine Police members acknowledged an internal affairs investigation into the 11-01-2014 incident where police shot a dog named Angel. During the last twelve days, Racine Police has refused comment to the inquiries of an internal investigation being conducted. Today is a turning point for Racine residents. Racine Police forensics investigator Todd Hoover recovered video evidence located at a residence across the street from the incident. The video contains roughly 5 hours of footage. The D.A. 's office had been provided a two hour video of the incident several days ago by RCC. With video evidence now in the hand's of the D.A. , Art Howell and his staff were forced to acknowledge the existence of the evidence and therefore had to recover the video surveillance at the neighbors home. Anybody want to guess as to why they didn't want to secure the video? Unnamed sources told us that this is the worst police work he had seen in over thirty years. "Racine Police failed to interview witnesses to the incident, failed to take statements, ordered witnesses to shut up and go inside, and then they kill the dog. Police had an opportunity for a non lethal ending a half hour after the gun vs.machete incident occurred. Neighbors who are friendly to Mr. Hanson were trying to calm him but were ordered back into their house by police. "Cover up from the opening seconds after the dog was killed"
The Racine Police Department has released select 911 audio of the incident, perhaps to spin favorable public opinion of their actions, it didn't work in our minds. Racine County Corruption is planning to file a writ of Mandamus for the production of all 911 calls concerning the incident. Only with all the evidence can one hope to find justice. Does the above list look like an officer’s job? The above information isn’t secret or unwritten. You have to know how to read to get this information and that is where one of Racine’s problems is. When it comes to reading and pets, Racine Police Chief Art Howell and his staff has failed to embrace written police science that would promote public trust, reduce department cost, and end the trauma the public endures every time a pet is killed by police. Had Cheifless Howell read some of the writings of Bernard Melekian and embraced the science of community policing, we wouldn't be writing about this today. Instead Chiefless Howell is part of a national epidemic of police pet killings. In part because he has militarized his troops and is running his department as an occupying army. Howell obviously doesn't understand community policing and believes a show of force is necessary to settle unrest. The killing of Angel is a huge embarrassment for the police department, the incident has divided its troops and deflated the esprit de corps. Internal affairs are now interviewing their own staff, sifting thru their reports, and preparing to do what police should have done the day of the incident. Detectives must now backtrack and interview citizens who witnessed the incident, collect evidence and write new reports . Outburst between police and citizens are occurring on a daily basis. One of the noted outbursts by police was directed to a citizen who provided us with video recordings of the event. The police outburst chastised the citizen for not calling the police and telling them that he had this video. Whatever happened to due diligence? The police failed to asked for any video from many of the witnesses and further neglected to take statements from all witnesses. These are basic and fundamental tasks of law enforcement, but not in the Racine Police Department. The police traumatized witnesses to the incident, failed to professionally do their job that day and are now chastising witnesses for failing to come forward. The noted police outburst occurred after we had turned over video to the D.A.’s office. Can you imagine the exchange of words that has occurred between the police and D.A. 's office regarding the failures of Racine Police to perform basic tasks? Can you imagine the position the D.A’s office is now in after they have filed charges base on incompetent acts, errors, omissions and misconduct by the Racine police department. I’m glad I’m not the D.A. The D.A. 's office now has to clean up the mess the Racine Police Department has given him. As we reflect on the events leading to the death of Angel, the Racine police department obviously has basic training and judgment issues. And that my friends is all that we can expect from Chiefless Howell. Notice how Art's picture is missing? There is a secret ( not any longer) active internal investigation in the Racine Police Department regarding errors, acts, omissions and misconduct of an incident that occurred on 11-01-2014. Dah.... I wonder which incident that might be? Better yet ,we are in possession of security video that the Racine Police Department failed to recover. Neighbor with gun pounds on front door and confronts Hanson on Hanson's property. Yeah, that's what is on it! Nothing until we provided the video to the Racine District Attorneys office. The D.A's office is now all over this case. Are you still laughing Art? Does Art Howell look a little smaller today? 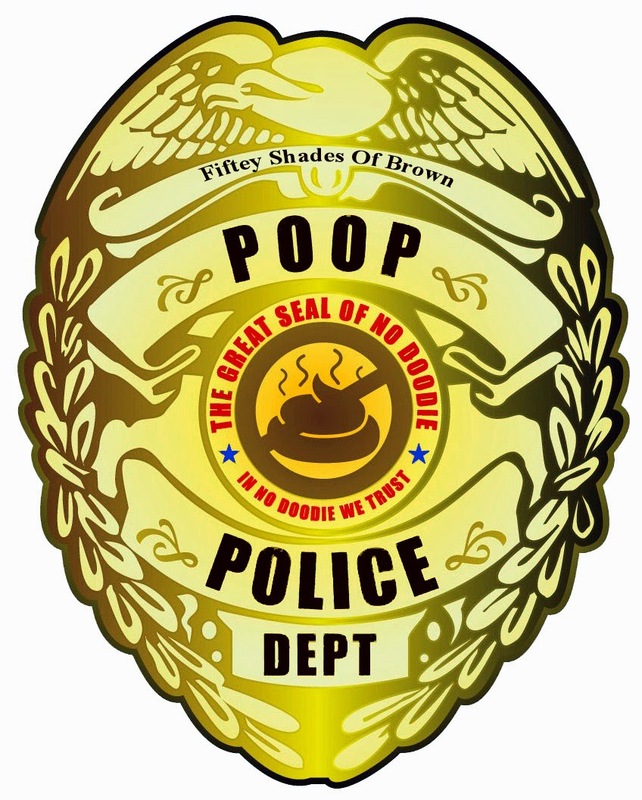 Does the Poop Police Badge look larger? Folks, I just came back from viewing surveillance videos of the killing of Angel….. These videos have not yet been released to the public. One of the video’s clearly show a man in Mr. Hanson’s yard pointing what appears to be a gun directly at Mr. Hanson. After watching some of the other videos, it appears the wrong man may have been arrested. Further I am told Racine Police pointed their weapons directly at witnesses of the event. Was this to intimidate witnesses? We are now collecting statements and affidavits from these witnesses. We at RCC have asked the Racine County District Attorney’s office to appoint a special investigator in light of these findings. Art Howell, in light of these findings, there is no longer surrender terms for you anymore. 1. The immediate cease fire of Racine Police killing of pets. 2. The immediate implementation of training Racine Police of the use of non lethal methods of animal control. 3. The immediate implementation of non lethal methods used by Racine Police to control animals until animal control arrives at the scene. 4. Art Howell will personally renounce the killing of all non aggressive animals by Racine Police and take appropriate disciplinary action against all officers responsible for harming a citizen’s pet. 5. The Racine Police Department shall respect a citizen’s pet as highly as it respects their K-9’s life. 6. Failure to immediately implement above demands will result with efforts to remove Art Howell from office. Art Howell will further acknowledge that the use of militarized tactics by the Racine Police Department on 11-01-2014 further reduced the chances of a peaceful resolution to the incident. There are no negotiations to these demands. This is how Art Howell will bury his DOG ! This is how Art Howell will bury your DOG! The Racine Police Dept. kills dogs. Is a dog property or life? 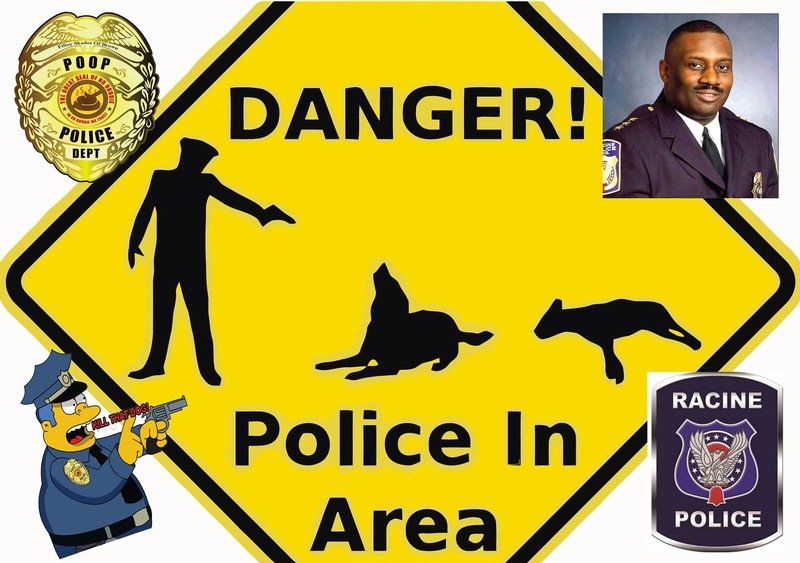 Can Art Howell reasonably expect criminals to value a K-9’s life when the Racine Police Dept. view a dog only as property? When the criminals are facing a distressing scene by the K-9, will the criminal kill the K-9, then quote the Racine police dept. that he needed to calm and stabilize the scene to protect himself? The Racine Police dept. cannot reasonably view a dog as property and expect the criminals to view their dog as life. Will Art Howell remain silent if and when one of the K-9’s are killed in the line of duty? Will the Racine Police dept. place the dead K-9 in a garbage bag and dispose of the dog in the trash as Racine Police did on 11-01-2014 with the Blue Heeler? I don’t think so and neither should you. In community police work, respect and trust is something that is earned, not given. It is a flowing two way street between the police and the public. On 11-01-2014, Racine Police failed to properly perform its duties, shaking the confidence and trust of the public by the unwarranted killing of a dog. The cold and cowardly act of shooting a dog that poses no aggression towards the public or the police is criminal, reprehensible and totally unacceptable behavior. The 11-01-2014 incident has several criminals acts committed by the police, which should be thoroughly investigated by the Racine County District Attys. office. Whether it was a knee jerk reaction or planned killing of the Australian Blue Heeler reflects the lack of training, discipline and values of life of the Racine Police dept. The incident further reflects how deeply entrenched the Racine Police Dept. is in using militarized tactics instead of using community policing to end incidents peacefully. During the 11-01-2014 standoff that lasted more than 3 hours, none of the following non lethal options were utilized. Were any of these options even considered? There are many more nonlethal options that could have been utilized during the 11-01-2014 event, why wasn't non lethal options used on 11-01-2014? The video of the cowardly killing of the Blue Heeler has been shown around the world. What is the next ugly video of Racine Police going to depict next? THE RACINE POLICE HAS DEMONSTRATED THEIR FORCE AS AN OCCUPYING ARMY. Citizens keep your cameras ready, the Racine Police Dept. won't change their ways without your oversight. has been awarded the coveted "Fifty Shades of Brown" "Poop Police Badge" ! 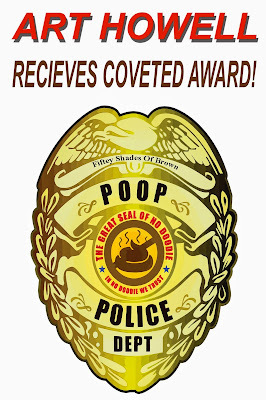 This infamous Poop Police Badge is recognition for a job poorly done. Art Howell is the second person in Racine County to receive this unwanted distinction. On 11-01-2014 the Racine Police Department responded to a complaint of blown leaves, dog poop, a drunken neighbor and threats. During the incident, Racine police shot and killed an Australian Blue heeler dog in a cold and cowardly act. The dog posed no threat to the officers or the public. Of course one can argue several other violations of misconduct, but if this were the public that shot the dog, these two statutes would most certainly be viewed as filed charges. Art Howell has failed to learn the value of community policing. "Law enforcement officers must advance beyond automatically using their weapons when encountered by a dog"
" There are many other ways to ensure public and officer safety through diffusing dog encounters"
The report further goes on to say that failing to curb unnecessary dog shooting erodes public trust and racks up cost from judgements and settlements. If Post Office employees can avert killing hostile dogs, the Racine Police Department can most certainly do a better job containing non threatening dogs as Angel. Law enforcement should act as servant/leaders, and should act accordingly. Law enforcement cannot reasonably expect the criminals to value a K-9's life when law enforcement doesn't value a dogs life. Art, wear your badge with shame.